Color/Appearance: Heartwood color typically a light to medium reddish brown, sometimes with darker blackish streaks. Color darkens upon prolonged exposure to light. Pale yellow sapwood distinct from heartwood, though transition is gradual. 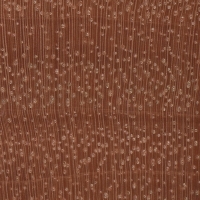 Grain/Texture: Quebracho has a fine, uniform texture with a high natural luster. Grain tends to be irregular, roey, and interlocked. 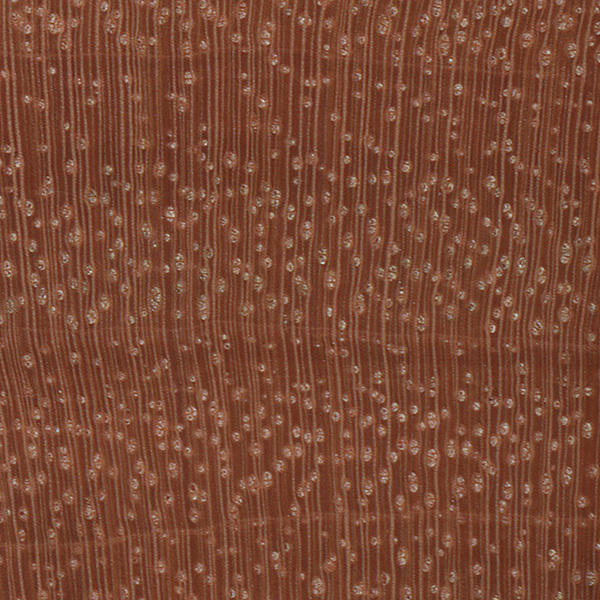 Endgrain: Diffuse-porous; medium to large pores in no specific arrangement, few to moderately numerous; primarily in radial multiples of 2-3; tyloses and other heartwood deposits present; narrow rays not visible without lens, normal spacing; parenchyma vasicentric and unilateral. Rot Resistance: Quebracho is rated as very durable, and is also resistant to insect attacks. Quebracho also has excellent weathering characteristics. Workability: Difficult to work on account of its density and irregular grain. High cutting resistance, as well as pronounced blunting effect on cutters. Dries slowly—and tends to crack, check, and warp while drying. Turns and finishes well, and also able to take on a high natural polish without any finishing agents. Odor: There is no characteristic odor associated with this wood species, though it is reported to have a bitter taste. Allergies/Toxicity: Although severe reactions are quite uncommon, Quebracho has been reported to cause respiratory irritation, as well as nausea. See the articles Wood Allergies and Toxicity and Wood Dust Safety for more information. 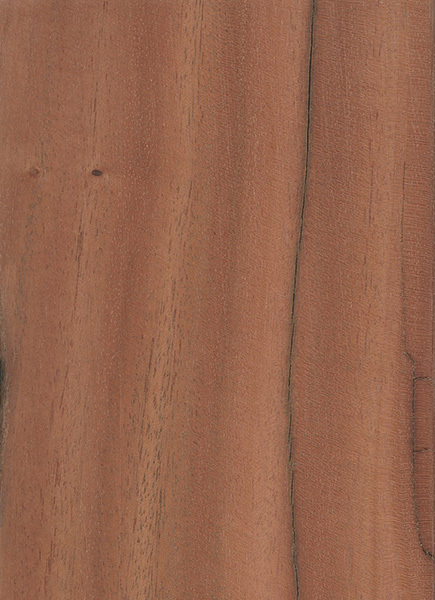 Pricing/Availability: Very seldom available in the United States, Quebracho is somewhat elusive as an imported hardwood. Expect prices to be in the medium to high range for an exotic wood. Sustainability: Quebracho is not listed in the CITES Appendices, and the IUCN reports that Schinopsis quebracho-colorado and S. balansae are species of least concern, though S. haenkeana is on the Red List as vulnerable due to a population reduction of over 20% in the past three generations, caused by a decline in its natural range, and exploitation. Common Uses: Heavy construction, railroad cross-ties, and fence posts (within its natural range), as well as furniture, and turned objects (when exported). Comments: The name Quebracho is from the Spanish quebrar hacha, which literally means “axe breaker.” Aptly named, wood in the Schinopsis genus is among the heaviest and hardest in the world. Quebracho was heavily exploited in the late 1800s for use in leather tanning. 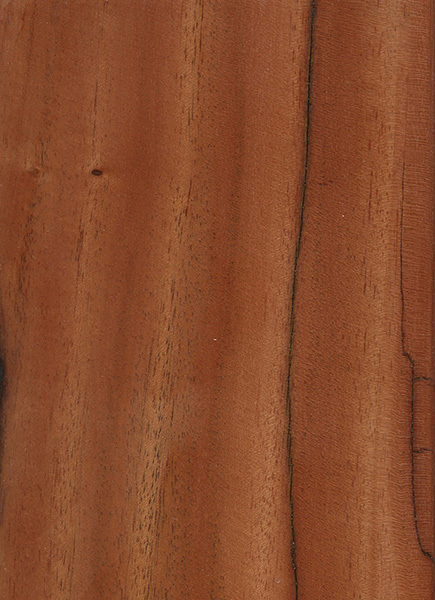 The tanin-rich heartwood (up to 20-30%) is cut into small chips, where the tanins can subsequently be extracted. Is it possible for me to make a walking/fighting cane out of this wood? Would I be successful? What kinds of tools would I need to work with this? Where can I get some? It sounds like seasoning is a major problem. Once the initial drying is over, how is the dimensional stability? 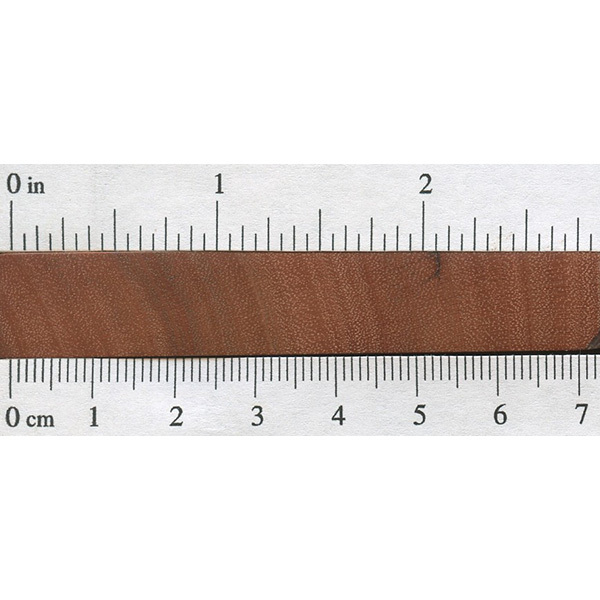 It’s a pity that the wood researchers mostly publish one shrinkage number for initial drying rather than also measuring movement in service. 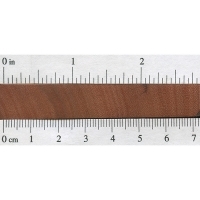 I’m looking to challenge myself by making a luxury folding wooden rule. Movement in service is clearly an issue, so I was looking at desert ironwood, African blackwood, and other very hard woods. It’s hard to know which is best. 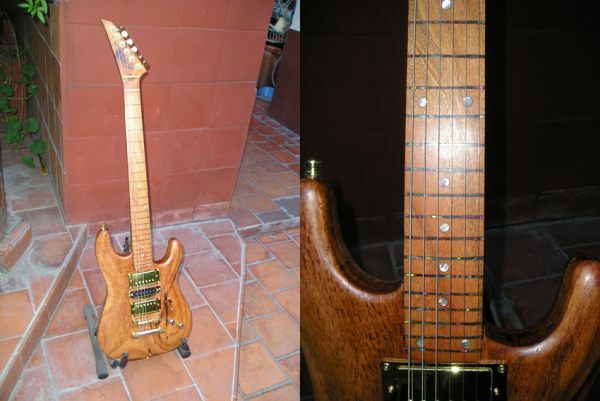 I made a guitar out of this wood (not recommended for people with back problems, it weights more than 7kg and you need a special strap, since the weight will break even a bass strap). This wood does have distinctive odour. The issue is its so hard that if you machine it, you will feel that odour mixed with the burning smell…..is not bitter, but more like a sweet-sour one and it’s very pleasent. The wood is also used in the wine industry (not for barrels but to use the tanines). It is better to work by hand than with machines (literally you will destroy any tool you use, router bits get unsharp after minutes, tablesaws will probably cause an accident rather than cut it)………..this wood is so hard, that I can guarantee, you hit it with a metal bar, and it will bend the bar barely doing any damage on the wood or not at all. Regarding insects attack, it is impossible it gets any damage once cut from the tree…….ther is only one type of bug which can affect it, but only on the nature, since this bugs first eat the bark from which it gets energy to attack it (but cannot get too deep neither). This wood is excellent for furniture. If you make a table to have indoors, it can last for literally hundreds of years. Just so you get an idea, you can see old railroads made with this wood, which have 90 years in Argentina (yes, they don’t fix their trains too much), and they have very little damage (the most you can see is some cracks on the surface, and they get very very dark color). If you sand this wood up to 1200 or more, the felling to the touch is outstanding. You literally don’t need any finish on it. Leaving it natural is best……..but oils do a great job giving a shine on them. Quebracho it’s for Quiebra Hacha, literally Axe Breaker. Cut up a random pallet where I am in the uk made from some tropical wood, didn’t know where it came from but was wondering why it was so heavy. I sanded it and it turns out they used this wood to make this pallet! Interestingly the small amount of sapwood had some rot but the heartwood was perfectly intact after being outdoors for who knows how long. I had to run it through the sander thicknesser as it has interlocked grain that would tear out with a planer. From tapping it, it sounds like it’ll be a great tonewood. Janka hardness says to be 23340N on this page, But if you click on “Top ten hardest woods”, it says 20340N. Wich is correct? Hmm, looks like a typo. Got it fixed, thanks. The correct value is 20,340 N.
Just curious, would this be suitable for an inlay for a ring? The cracking effect seems to happen primarily when exposed to the elements. The cracking originates on the outer exposed surfaces progressing over long periods into the inner structure. Common woodworking tools, drills, radial saws will work OK but must be used very slowly. Nails will not work at all because the hardness will only allow a nail to be driven 1/4 inch maximum. Pilot holes for screws again must be made almost at the screws diameter as the wood won’t deflect allowing the screw into the wood. My grandfather carved a head into a log of quebracho while traveling on a tramp steamer in the ’50s. The sculpture spent at least 15 years outdoors in new england with little ill effect, and was only brought indoors and treated better after ants moved in. I don’t know that they were feeding on the wood: it does not seem to have been significantly damaged by the ants.